HIV continues to be a challenge because it quickly mutates in ways that make existing drug treatments ineffective. FightAIDS@Home joined World Community Grid more than a decade ago with the simple but challenging goal of finding new treatments for HIV. During Phase 1 of the project, the team identified thousands of potentially promising candidates to be confirmed experimentally in the lab. However, because it’s cost and time prohibitive to lab test all the potential candidates, Phase 2 was created to prioritize the candidate compounds by evaluating them with more accurate methods. Our team is processing the current type of work units through World Community Grid as quickly as possible. Once these work units are completed, we plan to write a paper about the process, including its strengths, limitations, and lessons learned. We are also planning to use World Community Grid’s computing power to analyze new compounds that are important to our work with the HIVE Center at the Scripps Research Institute. This work will begin after we run a sample of these new compounds on our own grid computing network. We appreciate everyone who continues to donate their computing power to the search for better anti-HIV treatments. We also encourage everyone to opt in to Phase 2 of the project—the more quickly we can run through the current work units, the sooner we can move ahead to new compounds. In this extensive update, the FightAIDS@Home team leader, Prof. Art Olson, recaps nearly a decade of progress in the fight against AIDS: new computational methods, new understanding of key HIV proteins, and huge volumes of computational results that have only begun to be explored. Though Phase 1 is winding down, Phase 2 of this enormous project will continue to advance vital research into the world’s deadliest virus. 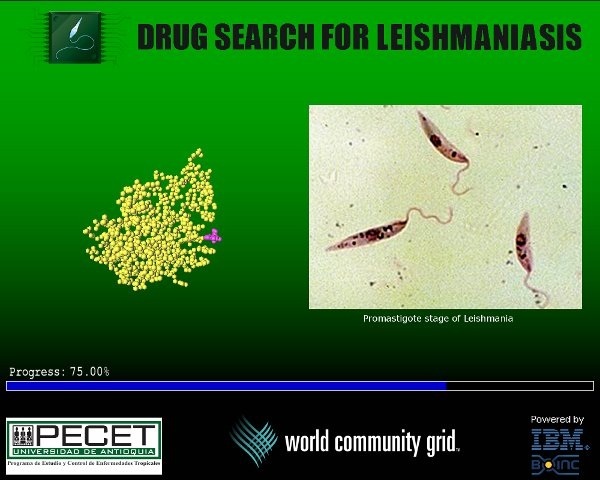 The FightAIDS@Home (FAAH) project joined World Community Grid almost 10 years ago, and is its longest continuously running project. Phase 1 is currently winding down, so it’s a good moment to give World Community Grid volunteers a summary of who we are, what our goals have been, what computational approaches have been enabled by the resources you have provided, and what we’ve accomplished to this point. We’re continually aware that this research is only possible because of your incredible generosity, and we hope you will all stay involved in Phase 2 of our work. FAAH, which uses computational studies to help advance the search for new treatments against HIV/AIDS, began on Entropia (a now-defunct distributed computing platform) in 2000 as a collaboration between Scott Kurowski, Tim Cusac, Dr. Garrett Morris, and myself. On November 21, 2005, FAAH joined World Community Grid. 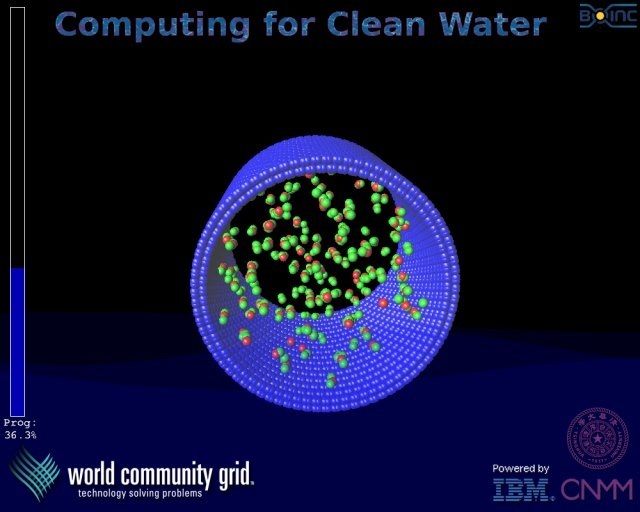 During the last decade, the constantly increasing computing power provided by World Community Grid volunteers enabled us to expand the scale of our HIV research by many orders of magnitude. As an added bonus, these tremendous resources also inspired us to create new tools and strategies to harness the potential provided by World Community Grid. These tools are not only increasing the efficiency and accuracy of our own computationally-driven studies against HIV, but also help advance the research that the rest of the scientific community pursues against other diseases. The FightAIDS@Home project has been run in the Olson Laboratory by a dedicated succession of Postdoctoral Research Associates over the past 10 years. Garrett Morris, William “Lindy” Lindstrom, Alex Perryman, and Daniel Santiago have in turn taken the lead in running our computational experiments on World Community Grid. They have been assisted over the years by several lab members including Michael Pique, Ruth Huey, Stefano Forli, Sargis Dallakyan, Alex Gillet, and Max Chang. As in most academic labs, postdocs stay for a period of 2 to 4 years and then move on to more permanent positions. Daniel Santiago has just left the lab, and we are currently interviewing for a new Postdoctoral Fellow to take his place. The Human Immunodeficiency Virus (HIV), the virus that causes Acquired Immunodeficiency Syndrome (AIDS), has infected over 70 million people throughout the world since this pandemic began. Currently, over 35 million people are infected with HIV, and there are over 2 million new infections each year. Almost one million people die from AIDS each year, which makes HIV the deadliest virus that afflicts humanity. The Olson Lab is interested in understanding the molecular mechanisms responsible for the evolution of drug resistance in HIV, and in using that understanding to help develop new therapeutic approaches to treat HIV-infected individuals. I direct an NIH-funded center called the HIVE (HIV Interaction and Viral Evolution) Center, which is composed of 14 individual laboratories in 8 different institutions around the country. The Olson laboratory, as well as that of Prof. Ron Levy at Temple University, is involved in the computational aspects of the goals of the Center. Our approach to the problem of drug resistance has been to simulate the interactions of synthetic organic molecules with viral proteins to predict which ones might bind to and affect the activity of these proteins. To do this, my Lab has developed and use two computational docking programs AutoDock and AutoDock Vina to screen large libraries of chemical compounds. The primary goal in these computations is to discover which compounds can potentially interact with and inhibit the activities of the so called “wild type” and drug resistant mutations of the proteins that have evolved in treated patients. The primary protein targets for this work have been the HIV protease (PR), integrase (IN), and reverse transcriptase (RT). These are the three proteins for which the FDA has approved drugs for the treatment of HIV-infected patients. They are also the three enzymes that the virus produces to carry out the chemical reactions that sustain the viral life cycle. By using the extensive structural data on wild type and mutant proteins, as well as mutational data from treated HIV-infected patients, we explore hypotheses and relationships between molecular structure and the development of drug resistance. 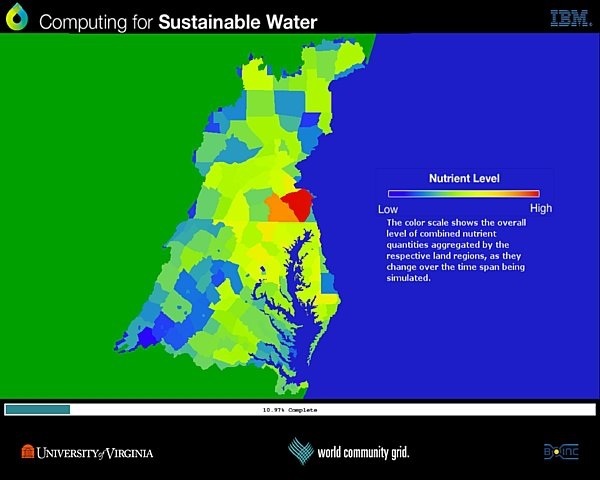 The computational resources of World Community Grid have been invaluable in extending our computational approaches in this research effort. In the initial years of FAAH, experiments generally involved computationally evaluating a few thousand compounds against one pocket of one type of the viral machinery – the active site of HIV protease. The “active site” is the region where the chemical work gets accomplished by an enzyme. HIV protease chops the long, viral, multi-protein polypeptide chain at several different, specific places. By cutting that multi-protein chain into different pieces, it then allows those different, individual proteins to fold up into their normal, mature shapes that are required for them to function. 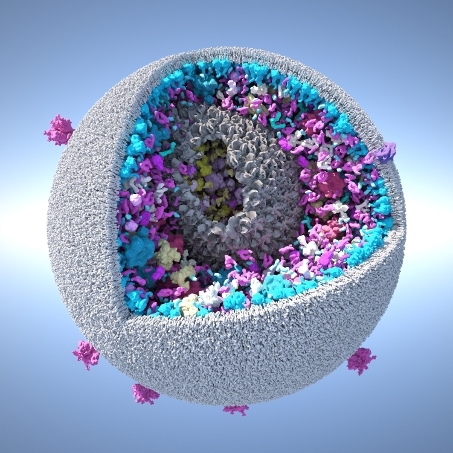 Those folded viral proteins work together to create new HIV particles that escape the infected cell, mature, and then infect new cells, which spreads the infection within the patient and allows the infection to spread to new people. When HIV protease activity is sufficiently disrupted, then those multi-protein viral polypeptide chains are no longer separated in an efficient, well-ordered manner. This causes the infected cell to produce immature, non-functional particles that are not able to infect other cells. Of greatest importance, when HIV protease drugs were combined with HIV reverse transcriptase drugs, the death rate associated with HIV infections drastically decreased. Before HIV protease drugs existed, getting HIV was basically a rapid and horrible death sentence. When HIV protease drugs were combined with other classes of anti-HIV drugs to make the HAART cocktails (Highly-Active Anti-Retroviral Therapy), then many HIV patients were able to live long, productive lives with a reasonable quality of life. However, since HIV keeps evolving into slightly different forms that are able to resist the effects of these drugs (that is, new multi-drug-resistant mutant superbugs keep appearing and spreading), we need to discover new types of drugs and therapeutic interventions that can disable these mutants. The computational docking problem is a high-dimensional search of possible interactions between two molecules, a chemical compound and a target viral protein. One must typically generate millions of poses of the two interacting molecules, and for each pose compute the energy of interaction between them. This energy evaluation is accomplished by summing up the interaction energies between all of the atoms in the two molecules. When we first developed AutoDock in 1990, a single docking would take 20 minutes or more on the fastest computers of that time. Today, thanks to Moore’s Law, such a calculation may take a few seconds to a minute depending on the complexity of the molecules involved. Thus, the ability to screen many molecules against a specific protein target (i.e. virtual screening) became possible. However, finding a good candidate molecule (a hit) that binds well to a functional site on a protein requires screening a very large number of chemical compounds. The larger the library of compounds, the better the chances that a good hit compound will be in that library. Having our FAAH project on World Community Grid has enabled us to run computations that would have taken literally hundreds of years on more conventional computer systems. We are now able to run virtual screens of chemical libraries against not a single protein target, but large panels of drug resistant mutant proteins of that viral target. The computing power of World Community Grid has also enabled us to increase the size of the libraries that we use in our virtual screens. Previously we were only able to screen libraries of a few thousand compounds. Today we typically screen combined libraries containing over 5 million compounds against each HIV protein target. This gives us a much better chance of finding good hit molecules. A critical aspect of computational docking is how the interacting molecules are represented or modeled. AutoDock was the first docking code that allowed the model of the chemical compound to be flexible when docking to a protein target. Each rotatable bond in the compound added another dimension to the search space that had to be explored, and thus to the complexity of the computation. In those days, the target protein had to be treated as a rigid molecule, since the complexity of its flexibility would be too computationally difficult to simulate. Using the power of World Community Grid, we have been able to overcome this restriction, and have implemented different representations of protein flexibility, giving us more realistic models of the protein target. To this point FAAH volunteers have donated over 340,000 years of computing time to our research efforts. By screening libraries of compounds against both wild type and numerous drug resistant mutant versions of HIV protease we have been able to characterize the range of the mutants that exist and cluster them into characteristic variants. This has given us a way to reduce the number of prototypic mutants of HIV PR that we need to use in our virtual screens, and has enabled us and others to focus our attention on the kinds of variations that the virus is capable of making to remain functional in the presence of drug therapies. As the number of World Community Grid volunteers and the amount of computer power they donated increased through the years, we have been able to greatly increase the size and complexity of the types of experiments we could perform. We have now docked millions of small molecule compounds against several different regions of all of the enzymes that HIV produces—protease, reverse transcriptase, and integrase. HIV reverse transcriptase is the part of the viral machinery that makes new copies of its genetic material. It takes the HIV RNA from the original viral particle and makes a more stable DNA version of it (called cDNA, or complementary DNA). HIV integrase then processes the viral DNA, by clipping part of each end off of it, to generate more reactive “sticky ends.” Integrase then permanently attaches the sticky ends of the viral DNA into our human DNA, to create a permanently infected cell, which will then go on to produce new copies of the virus. 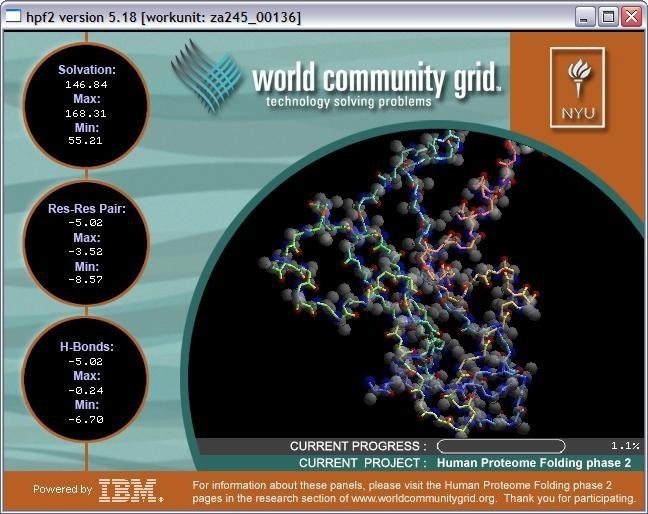 Thus, World Community Grid enabled us to computationally evaluate millions of compounds against many different regions of all of the viral machinery—instead of only being able to evaluate thousands of compounds against one region of one type of enzyme. It will take us many years to analyze these mountains of data, select the most promising candidate compounds, and experimentally evaluate these candidates in “wet lab” experiments performed by our collaborators. But we have created new tools to help us process and analyze these data more efficiently, and we are developing additional approaches to help us harvest more useful and more accurate information from the results that volunteers like you have produced. Most recently, we have turned our attention to the concept of synergistic inhibition of HIV enzyme function. In addition to targeting the active sites of these enzymes, we have also been able to search for new inhibitors that bind to “allosteric” sites on each of these viral nanomachines. Allosteric inhibitors have been discovered in both HIV integrase and reverse transcriptase. Most inhibitors disable the function of an enzyme by binding directly to the “active site” (the specific region of an enzyme where the chemical work occurs) and blocking its ability to function. The 9 FDA-approved HIV protease drugs are an example of these conventional types of inhibitors: they bind to and block the active site in the hollow tunnel in the center of protease, which prevents the viral multi-protein polypeptide from being able to bind within that tunnel and get cleaved. Allosteric inhibitors work in a very different way—they bind to a totally different site, regulate the conformational preferences and/or flexibility of the entire target protein, and thereby disable the active site. They bind far from the active site and project their influence over the rest of the enzyme. Allosteric inhibition is like putting a latch on the handles of a pair of scissors in order to prevent the blades from being able to open and close and cut things. Most importantly, different experiments with HIV, cancer, and malaria have shown that combinations of allosteric inhibitors and active site inhibitors can (a) generate combination therapies that are more effective against current superbugs and that (b) actually slow down the evolution of new drug-resistant mutants. There are no known allosteric inhibitors of HIV PR. However we have postulated that there may exist sites for allosteric inhibition of HIV PR. We have run FAAH virtual screens against candidate sites, and have found that there are chemical compounds that can bind to these sites. These observations are bolstered by experimental x-ray diffraction experiments on PR in the presence of a chemical fragment library. Observed in these experiments are 3 sites that are distal to the active site of HIV PR where chemical fragments bind. We have now focused on finding better binding compounds at these sites using our FAAH virtual screens. Some of the hits from of these screens have been verified by x-ray crystallography and NMR spectroscopy. Further development and optimization of these hits is ongoing. We are also working closely with other HIVE Center investigators, Prof. Kvaskhelia at Ohio State University, and Prof. Arnold at Rutgers University on improving allosteric inhibition for HIV integrase and reverse transcriptase, respectively. As stated above, we have only scratched the surface in terms of analyzing the enormous data sets that have been produced on World Community Grid. Typically we have only selected and looked at the very top candidates from a large virtual screen. Since the energy evaluation from docking is only a crude approximation of the true energy of binding, we, in fact could be selecting compounds that are not the best binders – so-called “false positives.” If we suggest to our collaborators to synthesize or buy such compounds, it can be very costly in time and money. Thus we are starting several efforts to reduce the number of false positives that arise from our virtual screens. Some of these efforts involve data mining of all of the FAAH results, looking at the interaction patterns of all of the compounds that are docked. This data can give us some chemical signatures that allow us to filter out the false positives from the true binders. This is ongoing work, but initial results look very promising. Another approach to this problem that has been developed in collaboration with the Levy Lab at Temple University involves a separate computational step that evaluates not just the top-scoring compound from a virtual screen, but many of the top ranked compounds. This computation uses sophisticated molecular dynamics based estimates of the free energy of binding, which are too computationally difficult to perform during the docking, but which can discriminate between true and false positives subsequent to the docking. This approach, called BEDAM, is being implemented with a molecular simulation tool called Academic IMPACT which is running on Phase 2 of our FAAH project on World Community Grid. In summary, World Community Grid volunteers have enabled an invaluable resource for our ongoing work in understanding the nature of drug resistance in HIV. As with most scientific projects, along with new results, new questions arise. Although we have yet to get a complete picture of the evolution of HIV drug resistance or create a new drug that defeats HIV resistance, we have developed new computational methodologies and have opened a number of avenues of research, that may lead to better approaches to treating and possibly even curing HIV infection. We’ve recently been invited to write a chapter for an upcoming book: The Future of HIV-1 Therapeutics. Our chapter focuses on structure-based drug design, and discusses the benefits of in silico modeling for dramatically expanding the scope and effectiveness of structure-based research. We pay particular attention to the benefits of the large-scale computation network that we found in World Community Grid. Recently, we have been invited to write a chapter for a book on the advancements of HIV therapy, entitled: The Future of HIV-1 Therapeutics: Resistance is futile?. Our chapter, entitled Computational Challenges of Structure-Based Approaches Applied to HIV provides a perspective on the application of computational methods to the design of new drugs, and discusses how World Community Grid is essential to our research efforts. Structure-based drug design relies on the availability of crystallographic structures of the target proteins, which are used to test large libraries of compounds (often several millions) in silico to identify potential new drugs. In fact, the design of HIV protease inhibitors in the mid-1990s is often presented as the first successful example of the advantages of computational structure-based drug design. Docking such a vast number of virtual compounds is a challenge in itself. Also, most of the target present various degrees of flexibility. Modeling this aspect adds another level of complexity, which can dramatically increase the number of calculations. However, when dealing with viruses, such the HIV-1, that mutate at a very high rate, things get even more problematic. In fact, many proteins produced by the virus during the infection can present mutations that render known powerful drugs ineffective. In a specific section of the chapter (Large Scale Modelling), we describe in detail how IBM and World Community Grid made it possible to handle such an incredible amount of computation in FightAids@Home (FAAH). The computer time donated by the volunteers (over 300,000 computing years and counting! ), and made available through World Community Grid, allowed us to design and perform experiments that would have been prohibitive with conventional computational resources. We close the chapter discussing the new targets that are becoming available, and the new modeling techniques that are building larger and more detailed models of the whole virus. This will present new opportunities and yet more challenges for the design of HIV-1 drugs. With the help of World Community Grid and all the FAAH volunteers, we plan to face those challenges and to further extend the boundaries of research. We review some of the opportunities and challenges that we face in computational modeling of HIV therapeutic targets and structural biology, both in terms of methodology development and structure-based drug design (SBDD). Computational methods have provided fundamental support to HIV research since the initial structural studies, helping to unravel details of HIV biology. Computational models have proved to be a powerful tool to analyze and understand the impact of mutations and to overcome their structural and functional influence in drug resistance. With the availability of structural data, in silico experiments have been instrumental in exploiting and improving interactions between drugs and viral targets, such as HIV protease, reverse transcriptase, and integrase. Issues such as viral target dynamics and mutational variability, as well as the role of water and estimates of binding free energy in characterizing ligand interactions, are areas of active computational research. Ever-increasing computational resources and theoretical and algorithmic advances have played a significant role in progress to date, and we envision a continually expanding role for computational methods in our understanding of HIV biology and SBDD in the future. CAN ONE PERSON MAKE A DIFFERENCE? YOU BET! As part of Office of Science and Technology Policy ‪#‎WHCitSci‬ forum, we are very happy to announce the second phase of our FightAIDS@Home project. 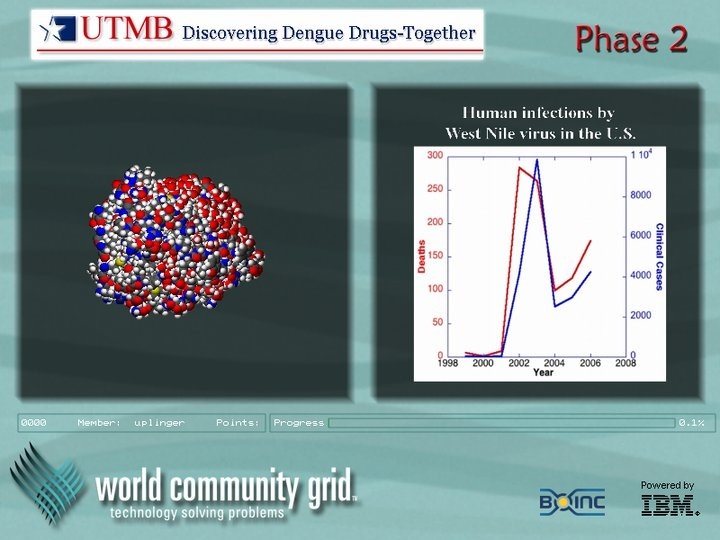 10 years of virtual simulations for FightAIDS@Home is considered the biggest drug docking experiment ever conducted. Now the challenge is to find the better drugs, fast. That’s where Phase 2 and you come in. Join FightAIDS@Home to help support pioneering HIV research. There have been some amazing advances in the fight against the human immunodeficiency virus (HIV), including treatments that have improved and extended millions of lives. But the fight continues – HIV is continually mutating, and as it does it evolves resistance to existing treatments. With tens of millions of people currently living with HIV, and millions more infected every year, the search for more effective HIV treatments is as critical as ever. Our team is therefore launching a new phase of HIV research to build on the success of the first phase and more accurately analyze the most promising drug candidates we’ve identified so far. For almost a decade, FightAIDS@Home has contributed to this fight by exploring different ways of disabling the virus. World Community Grid members have provided my team an unprecedented amount of computing power, enabling us to investigate a huge number of potential cures. To date, volunteers have performed over 20 billion comparisons between candidate chemicals and different binding sites on the virus. Along the way, our team has improved the tools used in the fight, by developing – and validating – software tools to simulate chemical binding, and discovering new potential binding sites for drugs to attack. These tools have even supported other medical research efforts, both on World Community Grid and elsewhere. The massive success of FightAIDS@Home has also generated a new challenge: thousands of potential ‘hits’ (chemicals that might form the basis of effective drugs) – a handful of which we’re synthesizing for additional testing. But because there are so many, it is prohibitively expensive and time consuming to synthesize and lab test all of those chemicals. The project now needs a new computational method to double-check the promising Phase 1 results, and ensure that only the most thoroughly vetted and probable candidate compounds proceed for further investigation. Phase 2 of FightAIDS@Home will address both of these goals: refining the Phase 1 results and validating the technology needed to make more accurate simulations. 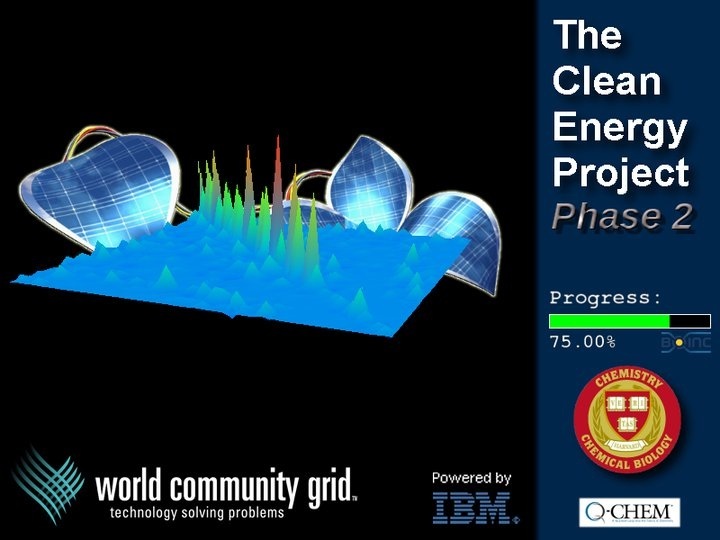 Specifically, Phase 2 uses a new analysis technique called BEDAM (Binding Energy Distribution Analysis Method), which is implemented using software called Academic IMPACT developed by our collaborators at Temple University. BEDAM has proven effective at carrying out more accurate simulations in computational contests, but thanks to World Community Grid volunteers, we now have an opportunity to apply it to analyze molecules at an unprecedented scale. This is important because if successful, these techniques can be applied to other drug discovery searches beyond HIV. Collaborating labs for the HIVE Center. Prof. Art Olson directs the Center and collaborators include Prof. Ron Levy, who is partnering with the FightAIDS@Home project. Phase 2 is more radical than its name suggests – World Community Grid volunteers have the opportunity to help us validate a new promising research paradigm that can help the search for treatments for many diseases, not just HIV. It’s only because of the commitment shown by volunteers that FightAIDS@Home has been able to accomplish so much thus far. We hope we can count on your continued support as we continue this important journey. 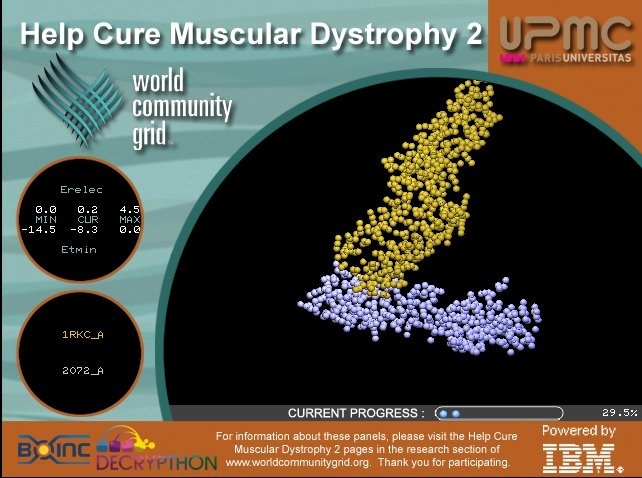 To contribute to FightAIDS@Home – Phase 2, join World Community Grid, or if you are already a volunteer, make sure the project is selected on your My Projects page. Thanks to the incredible generosity of World Community Grid volunteers, the FightAIDS@Home project team has finished with an important stage of their project. The research team has refocused on analyzing their existing results and preparing for the end of this historic grid computing stage. FightAIDS@Home has been running on World Community Grid in some form almost since the beginning of World Community Grid itself: our project launched in 2005. Thanks to the enormous and ongoing support of our worldwide community of volunteers, we have expanded the scope of our research and explored new targets and drug candidates that we simply could not imagine at the outset. It hardly seems sufficient to say thank you for donating over 330,000 years of processing time to support our research, but once again, from all of us to all of you: thank you. Clearly we could not do this research without you. With your help, we have reached a new milestone: no new AutoDock (AD) or AD Vina docking experiments are currently being generated. Put another way: we’re done creating new work tasks. The AutoDock queue is now empty, and the AD Vina queue has more than a year’s worth of jobs left. Most of our efforts have shifted towards analysis. The analysis of the FightAIDS@Home data has several levels of difficulty due to the sheer amounts of data, which are comprised of several structures of any drug target as well as millions of small molecules, resulting in hundreds of millions of data points. We are attempting to use a couple of approaches to mine this data, one of which includes examining amino-acids involved in top-ranked dockings. 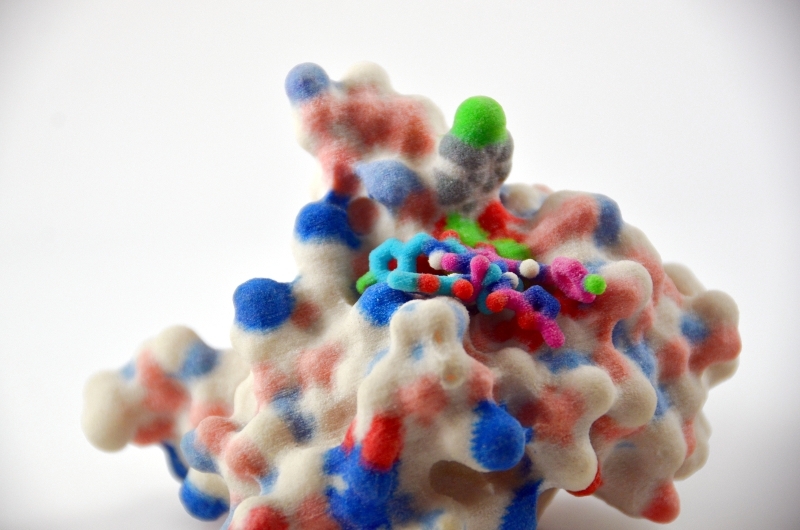 Another approach is to investigate the atomic coordinates of important interactions (pharmacophore) between the protein and the small molecule that was docked. Figures 1 and 2 (below) illustrate a simple example of inhibitor TL3 (Figure 1) and the predictions of 1 experiment (Figure 2, ~5.5 million dockings on 1 protein structure). Of course, these evaluations must be done with a large set of known inhibitors and across myriad protein structures. Once these methods pass a high level of confidence, molecules will be bought and sent to collaborators to be tested. Figure 1. 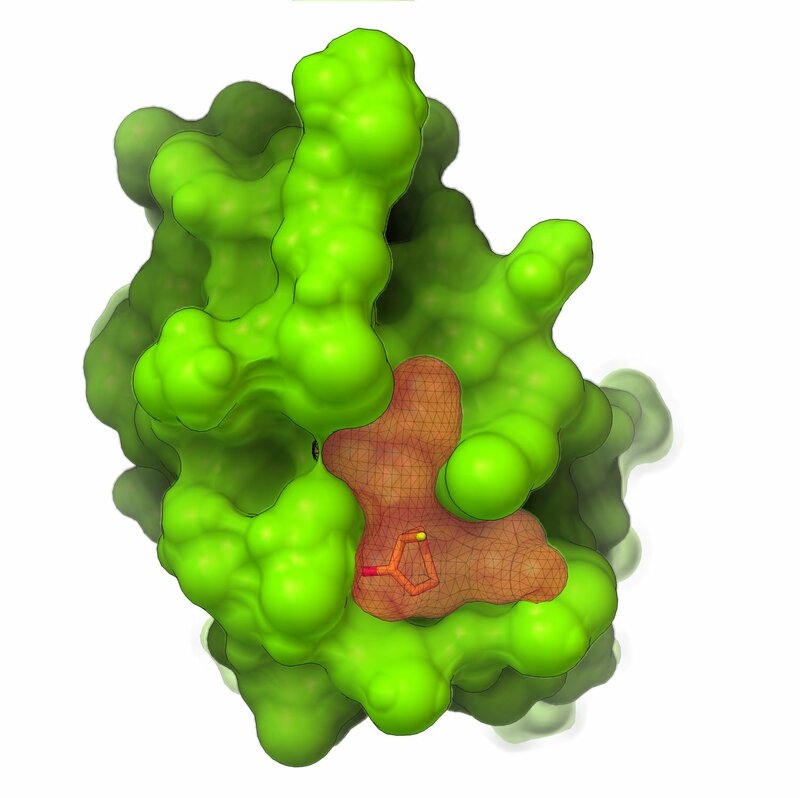 Docked pose of known HIV-1 protease inhibitor TL3 in an HIV-1 protease structure (not shown). Spherical representations (accompanied with dots, orange for TL3, green for a water molecule) represent important locations for protein-ligand interactions that are used to evaluate if a molecule may be a good drug candidate. The green sphere represents the location of an important (“flap”) water molecule often observed in HIV-1 protease co-crystal structures. The 2 orange spheres directly below the green sphere represent two locations of an interaction with significant amino acids (Asp25) of HIV-1 protease. Figure 2. Same docked pose of TL3 in HIV-1 protease as Figure 1 with top percentage of interactions from 1 experiment (pink spheres) and several predictions (transparent surfaces) for important protein-ligand interactions. 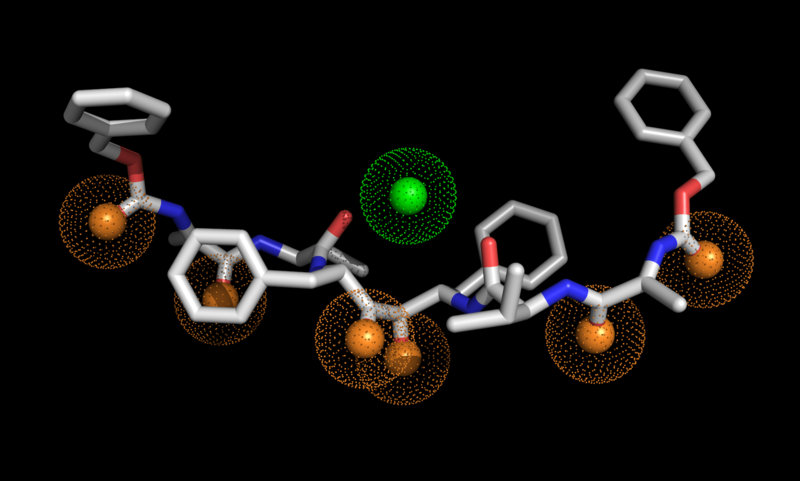 Note that the water molecule (green) and the 2 orange interactions below it are always predicted. Over the past two years, the phrase “HIV cure” has flashed repeatedly across newspaper headlines. In March 2013, doctors from Mississippi reported that the disease had vanished in a toddler who was infected at birth. Four months later, researchers in Boston reported a similar finding in two previously HIV-positive men. All three were no longer required to take any drug treatments. The media heralded the breakthrough, and there was anxious optimism among HIV researchers. Millions of dollars of grant funds were earmarked to bring this work to more patients. But in December 2013, the optimism evaporated. HIV had returned in both of the Boston men. Then, just this summer, researchers announced the same grim results for the child from Mississippi. The inevitable questions mounted from the baffled public. Will there ever be a cure for this disease? As a scientist researching HIV/AIDS, I can tell you there’s no straightforward answer. HIV is a notoriously tricky virus, one that’s eluded promising treatments before. But perhaps just as problematic is the word “cure” itself. Science has its fair share of trigger words. Biologists prickle at the words “vegetable” and “fruit”—culinary terms which are used without a botanical basis—chemists wrinkle their noses at “chemical free,” and physicists dislike calling “centrifugal” a force—it’s not; it only feels like one. If you ask an HIV researcher about a cure for the disease, you’ll almost certainly be chastised. What makes “cure” such a heated word? 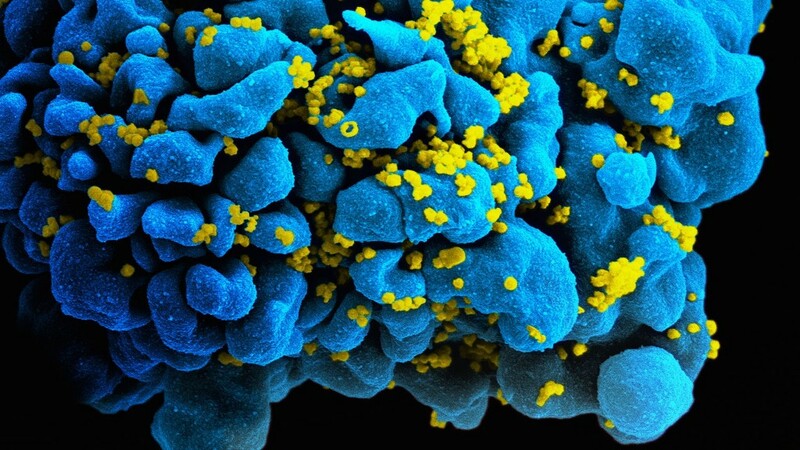 HIV hijacks the body’s immune system by attacking T cells. It all started with a promise. In the early 1980s, doctors and public health officials noticed large clusters of previously healthy people whose immune systems were completely failing. The new condition became known as AIDS, for “acquired immunodeficiency syndrome.” A few years later, in 1984, researchers discovered the cause—the human immunodeficiency virus, now known commonly as HIV. On the day this breakthrough was announced, health officials assured the public that a vaccine to protect against the dreaded infection was only two years away. Yet here we are, 30 years later, and there’s still no vaccine. This turned out to be the first of many overzealous predictions about controlling the HIV epidemic or curing infected patients. The progression from HIV infection to AIDS and eventual death occurs in over 99% of untreated cases—making it more deadly than Ebola or the plague. Despite being identified only a few decades ago, AIDS has already killed 25 million people and currently infects another 35 million, and the World Health Organization lists it as the sixth leading cause of death worldwide. HIV disrupts the body’s natural disease-fighting mechanisms, which makes it particularly deadly and complicates efforts to develop a vaccine against it. Like all viruses, HIV gets inside individual cells in the body and highjacks their machinery to make thousands of copies of itself. HIV replication is especially hard for the body to control because the white blood cells it infects, and eventually kills, are a critical part of the immune system. Additionally, when HIV copies its genes, it does so sloppily. This causes it to quickly mutate into many different strains. As a result, the virus easily outwits the body’s immune defenses, eventually throwing the immune system into disarray. That gives other obscure or otherwise innocuous infections a chance to flourish in the body—a defining feature of AIDS. In 1987, the FDA approved AZT as the first drug to treat HIV. With only two years between when the drug was identified in the lab and when it was available for doctors to prescribe, it was—and remains—the fastest approval process in the history of the FDA. AZT was widely heralded as a breakthrough. But as the movie The Dallas Buyer’s Club poignantly retells, AZT was not the miracle drug many hoped. Early prescriptions often elicited toxic side-effects and only offered a temporary benefit, as the virus quickly mutated to become resistant to the treatment. (Today, the toxicity problems have been significantly reduced, thanks to lower doses.) AZT remains a shining example of scientific bravura and is still an important tool to slow the infection, but it is far from the cure the world had hoped for. In three decades, over 25 highly-potent drugs have been developed and FDA-approved to treat HIV. Then, in the mid-1990s, some mathematicians began probing the data. Together with HIV scientists, they suggested that by taking three drugs together, we could avoid the problem of drug resistance. The chance that the virus would have enough mutations to allow it to avoid all drugs at once, they calculated, would simply be too low to worry about. When the first clinical trials of these “drug cocktails” began, both mathematical and laboratory researchers watched the levels of virus drop steadily in patients until they were undetectable. They extrapolated this decline downwards and calculated that, after two to three years of treatment, all traces of the virus should be gone from a patient’s body. When that happened, scientists believed, drugs could be withdrawn, and finally, a cure achieved. But when the time came for the first patients to stop their drugs, the virus again seemed to outwit modern medicine. Within a few weeks of the last pill, virus levels in patients’ blood sprang up to pre-treatment levels—and stayed there. In the three decades since, over 25 more highly-potent drugs have been developed and FDA-approved to treat HIV. When two to five of them are combined into a drug cocktail, the mixture can shut down the virus’s replication, prevent the onset of AIDS, and return life expectancy to a normal level. However, patients must continue taking these treatments for their entire lives. Though better than the alternative, drug regimens are still inconvenient and expensive, especially for patients living in the developing world. Given modern medicine’s success in curing other diseases, what makes HIV different? By definition, an infection is cured if treatment can be stopped without the risk of it resurfacing. When you take a week-long course of antibiotics for strep throat, for example, you can rest assured that the infection is on track to be cleared out of your body. But not with HIV. The secret to why HIV is so hard to cure lies in a quirk of the type of cell it infects. Our immune system is designed to store information about infections we have had in the past; this property is called “immunologic memory.” That’s why you’re unlikely to be infected with chickenpox a second time or catch a disease you were vaccinated against. When an infection grows in the body, the white blood cells that are best able to fight it multiply repeatedly, perfecting their infection-fighting properties with each new generation. After the infection is cleared, most of these cells will die off, since they are no longer needed. However, to speed the counter-attack if the same infection returns, some white blood cells will transition to a hibernation state. They don’t do much in this state but can live for an extremely long time, thereby storing the “memory” of past infections. If provoked by a recurrence, these dormant cells will reactivate quickly. This near-immortal, sleep-like state allows HIV to persist in white blood cells in a patient’s body for decades. White blood cells infected with HIV will occasionally transition to the dormant state before the virus kills them. In the process, the virus also goes temporarily inactive. By the time drugs are started, a typical infected person contains millions of these cells with this “latent” HIV in them. Drug cocktails can prevent the virus from replicating, but they do nothing to the latent virus. Every day, some of the dormant white blood cells wake up. If drug treatment is halted, the latent virus particles can restart the infection. Latent HIV’s near-immortal, sleep-like state allows it to persist in white blood cells in a patient’s body for decades. HIV researchers call this huge pool of latent virus the “barrier to a cure.” Everyone’s looking for ways to get rid of it. It’s a daunting task, because although a million HIV-infected cells may seem like a lot, there are around a million times that many dormant white blood cells in the whole body. Finding the ones that contain HIV is a true needle-in-a-haystack problem. All that remains of a latent virus is its DNA, which is extremely tiny compared to the entire human genome inside every cell (about 0.001% of the size). The functional cure approach acknowledged that latency alone was not the barrier to a cure for HIV. There are other common viruses that have a long-lived latent state, such as the Epstein-Barr virus that causes infectious mononucleosis (“mono”), but they rarely cause full-blown disease when reactivated. HIV is, of course, different because the immune system in most people is unable to control the infection. The first hint that a cure for HIV might be more than a pipe-dream came in 2008 in a fortuitous human experiment later known as the “Berlin patient.” The Berlin patient was an HIV-positive man who had also developed leukemia, a blood cancer to which HIV patients are susceptible. His cancer was advanced, so in a last-ditch effort, doctors completely cleared his bone marrow of all cells, cancerous and healthy. They then transplanted new bone marrow cells from a donor. Fortunately for the Berlin patient, doctors were able to find a compatible bone marrow donor who carried a unique HIV-resistance mutation in a gene known as CCR5. They completed the transplant with these cells and waited. For the last five years, the Berlin patient has remained off treatment without any sign of infection. Doctors still cannot detect any HIV in his body. While the Berlin patient may be cured, this approach cannot be used for most HIV-infected patients. Bone marrow transplants are extremely risky and expensive, and they would never be conducted in someone who wasn’t terminally ill—especially since current anti-HIV drugs are so good at keeping the infection in check. Still, the Berlin patient was an important proof-of-principle case. Most of the latent virus was likely cleared out during the transplant, and even if the virus remained, most strains couldn’t replicate efficiently given the new cells with the CCR5 mutation. The Berlin patient case provides evidence that at least one of the two cure methods (sterilizing or functional), or perhaps a combination of them, is effective. Researchers have continued to try to find more practical ways to rid patients of the latent virus in safe and targeted ways. In the past five years, they have identified multiple anti-latency drug candidates in the lab. Many have already begun clinical trials. Each time, people grow optimistic that a cure will be found. But so far, the results have been disappointing. None of the drugs have been able to significantly lower levels of latent virus. In the meantime, doctors in Boston have attempted to tease out which of the two cure methods was at work in the Berlin patient. They conducted bone marrow transplants on two HIV-infected men with cancer—but this time, since HIV-resistant donor cells were not available, they just used typical cells. Both patients continued their drug cocktails during and after the transplant in the hopes that the new cells would remain HIV-free. After the transplants, no HIV was detectable, but the real test came when these patients volunteered to stop their drug regimens. When they remained HIV-free a few months later, the results were presented at the International AIDS Society meeting in July 2013. News outlets around the world declared that two more individuals had been cured of HIV. Latent virus had likely escaped the detection methods available. It quickly became clear that everyone had spoken too soon. Six months later, researchers reported that the virus had suddenly and rapidly returned in both individuals. Latent virus had likely escaped the detection methods available—which are not sensitive enough—and persisted at low, but significant levels. Disappointment was widespread. The findings showed that even very small amounts of latent virus could restart an infection. It also meant meant that the anti-latency drugs in development would need to be extremely potent to give any hope of a cure. But there was one more hope—the “Mississippi baby.” A baby was born to an HIV-infected mother who had not received any routine prenatal testing or treatment. Tests revealed high levels of HIV in the baby’s blood, so doctors immediately started the infant on a drug cocktail, to be continued for life. The mother and child soon lost touch with their health care providers. When they were relocated a few years later, doctors learned that the mother had stopped giving drugs to the child several months prior. The doctors administered all possible tests to look for signs of the virus, both latent and active, but they didn’t find any evidence. They chose not to re-administer drugs, and a year later, when the virus was still nowhere to be found, they presented the findings to the public. It was once again heralded as a cure. Again, it was not to be. Just last month, the child’s doctors announced that the virus had sprung back unexpectedly. It seemed that even starting drugs as soon as infection was detected in the newborn could not prevent the infection from returning over two years later. Despite our grim track record with the disease, HIV is probably not incurable. Although we don’t have a cure yet, we’ve learned many lessons along the way. Most importantly, we should be extremely careful about using the word “cure,” because for now, we’ll never know if a person is cured until they’re not cured. Clearing out latent virus may still be a feasible approach to a cure, but the purge will have to be extremely thorough. We need drugs that can carefully reactivate or remove latent HIV, leaving minimal surviving virus while avoiding the problems that befell earlier tests that reactivated the entire immune system. Scientists have proposed multiple, cutting-edge techniques to engineer “smart” drugs for this purpose, but we don’t yet know how to deliver this type of treatment safely or effectively. As a result, most investigations focus on traditional types of drugs. Researchers have developed ways to rapidly scan huge repositories of existing medicines for their ability to target latent HIV. These methods have already identified compounds that were previously used to treat alcoholism, cancer, and epilepsy, and researchers are repurposing them to be tested in HIV-infected patients. The less latent virus that remains, the less chance there is that the virus will win the game of chance. Mathematicians are also helping HIV researchers evaluate new treatments. My colleagues and I use math to take data collected from just a few individuals and fill in the gaps. One question we’re focusing on is exactly how much latent virus must be removed to cure a patient, or at least to let them stop their drug cocktails for a few years. Each cell harboring latent virus is a potential spark that could restart the infection. But we don’t know when the virus will reactivate. Even once a single latent virus awakens, there are still many barriers it must overcome to restart a full-blown infection. The less latent virus that remains, the less chance there is that the virus will win this game of chance. Math allows us to work out these odds very precisely. Our calculations show that “apparent cures”—where patients with latent virus levels low enough to escape detection for months or years without treatment—are not a medical anomaly. In fact, math tells us that they are an expected result of these chance dynamics. It can also help researchers determine how good an anti-latency drug should be before it’s worth testing in a clinical trial. Many researchers are working to augment the body’s ability to control the infection, providing a functional cure rather than a sterilizing one. Studies are underway to render anyone’s immune cells resistant to HIV, mimicking the CCR5 mutation that gives some people natural resistance. Vaccines that could be given after infection, to boost the immune response or protect the body from the virus’s ill effects, are also in development. In the meantime, treating all HIV-infected individuals—which has the added benefit of preventing new transmissions—remains the best way to control the epidemic and reduce mortality. But the promise of “universal treatment” has also not materialized. Currently, even in the U.S., only 25% of HIV-positive people have their viral levels adequately suppressed by treatment. Worldwide, for every two individuals starting treatment, three are newly infected. While there’s no doubt that we’ve made tremendous progress in fighting the virus, we have a long way to go before the word “cure” is not taboo when it comes to HIV/AIDS. Did you know that you can help in the fight against AIDS? By donating time on your computer to the Fight Aids at Home project of World Community Grid, you can become a part of the solution. The work is called “crunching” because you are crunching computational data the results of which will then be fed back into the necessary lab work. We save researchers literally millions of hours of lab time in this process. 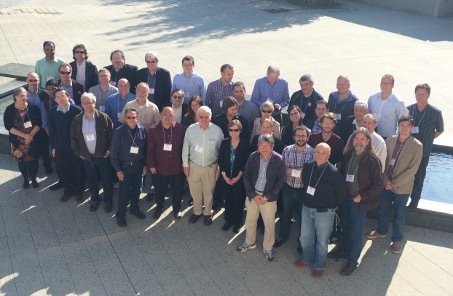 Vsit World Community Grid (WCG) or Berkeley Open infrastructure for Network Computing (BOINC). Download the BOINC software and install it on your computer. Then visit WCG and attach to the FAAH project. The project will send you computational work units. Your computer will process them and send the results back to the project, the project will then send you more work units. It is that simple. You do nothing, unless you want to get into the nuts and bolts of the BOINC software. If you take up this work, and if you see it as valuable, please tell your family, friends and colleagues, anyone with a computer, even an Android tablet. We found out that my wife’s oncologist’s father in Brazil is a cruncher on two projects from WCG. This is the projects web site. Take a look. While you are visiting BOINC and WCG, look around at all of the very valuable projects being conducted at some of the worlds most distinguished universities and scientific institutions. You can attach to as many as you like, on one or a number of computers. You can only be a help here, particpating in Citizen Science. Imaging studies have now confirmed some of the computational predictions made during FightAIDS@Home, providing important confirmation of our methodology and the value of your computational results. This work is ongoing, but promises to increase our understanding of how HIV protease can be disrupted. Our lab at the Scripps Research Institute, La Jolla, is part of the HIV Interaction and Viral Evolution (HIVE) Center – a group of investigators with expertise in HIV crystallography, virology, molecular biology, biochemistry, synthetic chemistry and computational biology. This means that we have world-class resources available to verify and build upon our computational work, including the nuclear magnetic resonance (NMR) facility at the Scripps Research Institute, Florida. NMR is a technique for determining the molecular structure of a chemical sample, and therefore is very useful for validating some of the predictions made during the computational phase of FightAIDS@Home. We’re excited to announce that our collaborators at Scripps Florida have now optimized their NMR experiments and have been able to characterize the binding of promising ligands with the prospective allosteric sites on the HIV protease. These sites represent new footholds in the search for therapies that defeat viral drug resistance. The NMR experiment allows us to detect the location of the interactions between the candidate inhibitors and the protein, but unlike X-ray crystallography experiments, these interactions are measured in solution, which better represents the biological environment. In fact, the first results from the NMR experiments validated the exo site we so thoroughly investigated in FightAIDS@Home. As a result, we now have experimental evidence that a small molecule binds to the exo site in solution with structural effects that seem to perturb the dynamic behavior of protease, even with a known inhibitor in the active site. There are many more NMR experiments still to run, but another advantage of NMR over crystallography is that it does not require the lengthy step of growing diffraction-quality crystals. This allows higher experimental throughput, so we look forward to experimental confirmation of many more compounds in much shorter time. So far we have shipped 15 compounds to test and another batch is going to be sent this week. The new compounds will help to validate another potential interaction site on one of HIV protease’s two movable “flaps”. Once the validation is completed, we will proceed to test a number of compounds that we identified in different FightAIDS@Home experiments for all of the target protease allosteric sites. As always, thank you for your support! This research would not be possible without your valuable computing time. The Scripps research team needs your help to continue making progress on developing new treatments for AIDS! Take part in our decade of discovery competition by encouraging your friends to sign up to World Community Grid today to start donating their computer or mobile device’s computing power to FightAIDS@Home. There’s just over a week left and some great prizes are up for grabs – get started today! Here’s to another decade of discovery. New methods and processes help the research team process World Community Grid data more efficiently and provide more accurate docking techniques. 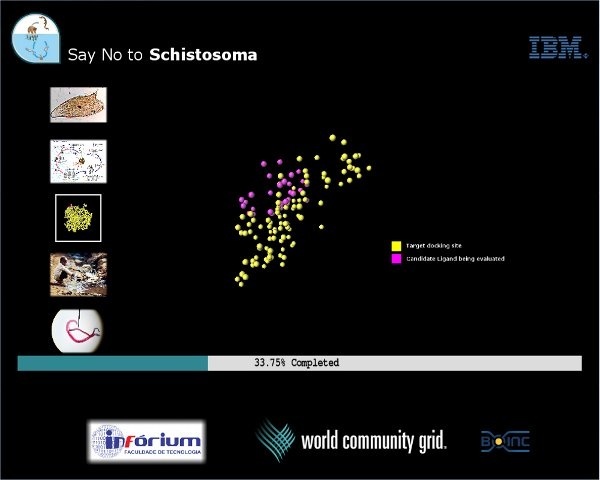 As the volume of data generated by World Community Grid volunteers for our FightAIDS@Home (FAAH) project has increased, so has our need to optimize how we handle and store that data. In this project update, we discuss new improvements in how we process the extremely high result data rate you generate, which is allowing us to focus more resources toward the analysis of FAAH data. Further, improved docking techniques are being created and applied from the results of deeper analysis coupled with ongoing experimental data from our collaborators. Example of repositioned side-chain, histidine, by Vina cycling through the original space-filling representation, original stick representation (orange), and new position compared to old position (dotted black lines). Managing the very large data throughput generated by World Community Grid volunteers for FAAH is a great challenge. Beside the scientific results we have achieved over the years, we also have developed novel software and protocols to process, analyze and store the results you generate quickly and efficiently. Recently, we exploited the parallel computational resources available at Scripps. In the last few months, we have shifted our processing of the incoming World Community Grid data to our local High Performance Computing cluster, Garibaldi. Since the implementation of the AutoDock Vina software for FAAH last year, you have generated several terabytes of compressed docking results each month, which was putting a strain on our storage system. Until recently, most of our work and resources have been focused on processing this data to make it suitable for deeper analysis. We had to devote most of our local computational power to this processing. With our new methods, we have increased the processing rate by several orders of magnitude with the use of multiple processors and the optimization of processing scripts. Processing a batch that used to take between 30 minutes to few hours now takes just a few minutes. Streamlined scripts and parallel processing has yielded 180,000 processed batches in two weeks. We have created new analysis programs using structural and statistical methods to mine more information from the results you generate. Statistical analysis tools will first be used to reduce over 5 million docked compounds to a few thousand top-ranking candidates. Structural information will then be used to cull the list further by filtering for key intermolecular interactions and against unfavorable interactions. A new database structure that will incorporate these programs is being developed to handle this large and fast-growing flood of results. Once optimized, the whole processing and analysis workflow will be fully automated. Importantly, what we have learned and are learning from these refined methods to handle big data will be made available in the AutoDockTools suite, which is utilized by many research labs worldwide. Proteins are typically large molecules and often can bend or flex in various ways at various points and at normal temperatures they rapidly bend to many or all of the possible configurations (bent shapes). When searching for ligands that might attach to a protein target, the ligand might not match the shape of the protein in one of its configurations, but might match in another configuration of the protein. By considering more configurations of the protein, it is more likely that a ligand can be found which matches one of the protein’s configurations. Since February 2014, we have been running flexible receptor side-chain Vina jobs on FAAH, which we expect to enhance our docking results. While our typical docking methods hold the protein structure rigid, the flexibility feature in AutoDock Vina allows selected residue side chain conformations to be sampled along with the flexible ligand molecule. This enables the protein pocket to adopt alternate shapes to better model protein-ligand binding and the so-called “induced fit”, minimizing the bias of using a rigid target structure. Currently, we are testing this approach on several sites (LEFGF, FBP, and Y3) in HIV integrase. The downside of performing flexible receptor calculations is that the search complexity increases, and computing run-times are therefore 5 to 10 times longer. The World Community Grid staff has been adjusting their methods to account for the different Flexible Vina work unit. Once these dockings have finished and the analyses performed, we will be able to optimize our application of Flexible Vina on World Community Grid and extend it to other targets. Another way to minimize rigid-protein bias in traditional docking is to dock to an ensemble of protein structures. Two ways to generate these ensembles, both used in FAAH dockings, are molecular dynamics (MD) simulations and simply using multiple available structures for a given protein receptor. The last hundred experiments have included ensembles ranging from tens to sometimes hundreds of receptor structures. Ensembles add another layer of analysis with the goal of achieving a more accurate ranking of compounds from several sources of data. Despite the encouraging results on the first hits previously reported, we are encountering experimental issues that are making the process of identifying hits very challenging. As often happens in science (and particularly in HIV-related experiments! ), it is hard to achieve robust and consistent statistics from biological assays.